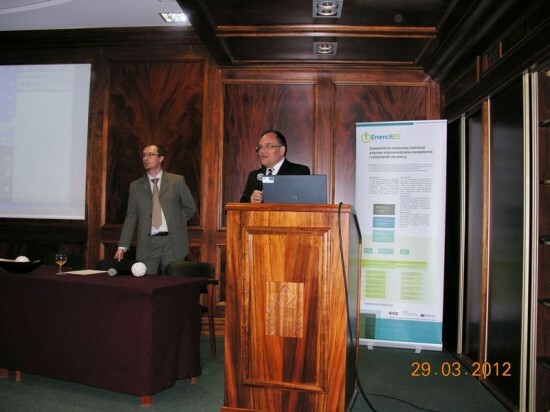 Regional EnercitEE conference was held in the capital of Lower Silesia, Wrocław, on 29 March 2012 » EnercitEE Blog - EnercitEE is a European project aiming at enhancing the understanding of Energy Efficiency among different stakeholders and improving the respective local and regional policies. 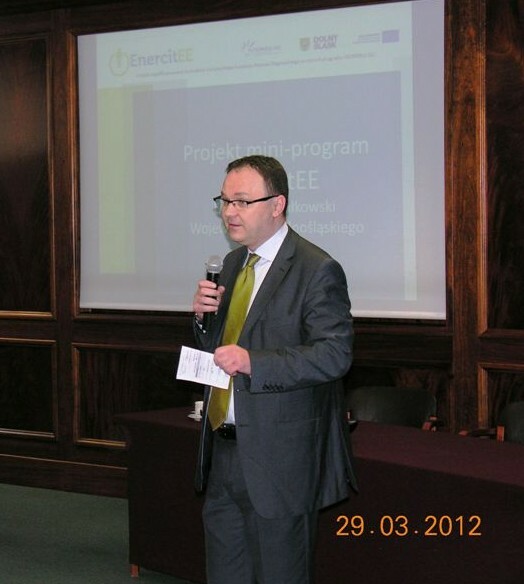 The conference was launched with a general description of the EnercitEE mini-programme. Afterwards three sub-projects with Polish partners, RIEEB, LEEAN and PRATLA were presented respectively by the representatives of the municipalities of Jelcz-Laskowice, Bielawa and KARR Development Agency, who underlined great benefits gained from their partnership in an international project on energy efficiency. Mr Bartłomiej Ostrowski, the head of the Marshal's Office International Unit for Cooperation and Projects, is addressing the audience. The other part was dedicated to the promotion of the Covenant of Mayors initiative – a European network for authorities inspired to practically reduce CO2 emissions by 20% by the year of 2020. Mr Gabor Nagy of the European Commission, which politically widely supports the network as a much praised bottom-up approach, provided an insightful view into the specifics and progress of the idea so far. He was followed by the representatives of two Lower Silesian municipalities, Bielawa and Dzierżoniów, discussing their experiences of taking part in the Covenant of Mayors and the things they managed to attain. At this point the participants could ask questions. Mr Jerzy Tutaj, the member of the board of the region. The conference was concluded with a good practice description of thermal refurbishment of a large regional health centre building featuring solar panels on the roof. As thermal refurbishment of existing buildings is still the most popular way to improve energy efficiency among Polish authorities (and might be a part of a Sustainable Energy Action Plan, SEAP), it should be noted that an increasing number of such investments is extended by some RES installation. 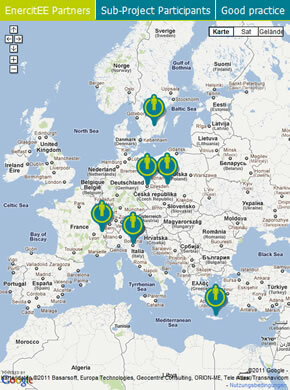 Finally different financing opportunities from the Intelligent Energy – Europe programme were presented. The programme still has some free funds available for institutions wishing to join the Covenant of Mayors. The event was a great opportunity for backstairs discussions, exchange of current knowledge and know-how and initiate potential cooperation. Everyone expressed desire to join another such conference, if it is held in the future.